We use in our daily life a large number of substances such as lemon, tamarind, common salt ,sugar and vinegar. Many substances that you encounter in your daily life have different properties. One major difference between substances is whether they are acidic or basic. Some of the substances like Lemon juice, Vinegar, Curd, Grapes ,Unripe mango, Sugar, Tamarind taste sour, some taste bitter,some taste sweet and some taste salty. Curd, lemon juice, orange juice and vinegar taste sour. These substances taste sour because they contain acids. The chemical nature of such substances is acidic. The word acid comes from the Latin word acere which means sour. 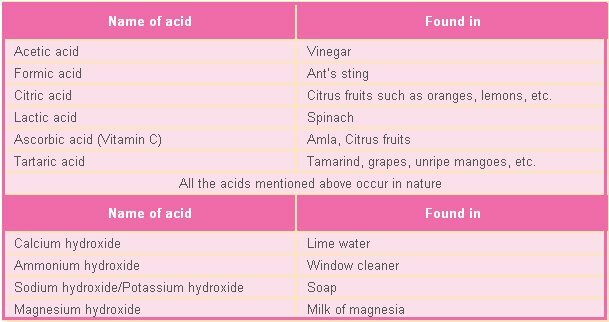 The acids in these substances are natural acids. Baking soda does not taste sour it means, that it has no acids in it. It is bitter in taste. If you rub its solution between fingers, it feels soapy. Substances like these which are bitter in taste and feel soapy on touching are known as bases. The nature of such substances is said to be basic. Special type of substances are used to test whether a substance is acidic or basic. These substances are known as indicators. The indicators change their colour when added to a solution containing an acidic or a basic substance. Turmeric, litmus, china rosepetals (Gudhal), etc., are some of the naturally occurring indicators. The most commonly used natural indicator is litmus. It is extracted from lichens (. It has a mauve (purple) colour in distilled water. When added to an acidic solution, it turns red and when added to a basic solution, it turns blue. It is available in the form of a solution, or in the form of strips of paper, known as litmus paper. Generally, it is available as red and blue litmus paper . Mix some water with lemon juice in a plastic cup/tumbler/test tube. Put a drop of the above solution on a strip of the red litmus paper with the help of a dropper. Is there any change in colour? Repeat the same exercise with the blue litmus paper. Take a tablespoonful of turmeric powder. Add a little water and make a paste. Make turmeric paper by depositing turmeric paste on blotting paper/filter paper and drying it. Cut thin strips of the yellow paper obtained. Put a drop of soap solution on the strip of turmeric paper. You can prepare a card for your mother on her birthday. Apply turmeric paste on a sheet of plane white paper and dry it. Draw a beautiful flower with soap solution with the help of a cotton bud. You will get a beautiful greeting card.To prepare limewater, dissolve some lime (chuna) in water in a bottle. Stir the solution and keep it for some time. Pour a little from the top. This is lime water.You may try solutions of other substances also. Collect some China rose (Gudhal ) petals and place them in a beaker. Add some warm water. Keep the mixture for some time till water becomes coloured. Use the coloured water as an indicator. Add five drops of the indicator to each of the solutions. A solution of china rose turns green in a basic solution, and bright pink or magenta in an acidic solution. The teacher is requested to get the following dilute chemicals from his/her school laboratory or from a nearby school: hydrochloric acid, sulphuric acid, nitric acid, acetic acid, sodium hydroxide, ammonium hydroxide, calcium hydroxide (lime water). As the name indicates the rain containing excess of acids is called an acid rain. Where do these acids come from? The rain becomes acidic because carbon dioxide, sulphur dioxide and nitrogen dioxide (which are released into the air as pollutants) dissolve in rain drops to form carbonic acid, sulphuric acid and nitric acid respectively. Acid rain can cause damage to buildings, historical monuments, plants and animals. Great care should be taken while handling laboratory acids and bases because these are corrosive in nature, irritating and harmful to skin. Acids are sour in taste. Bases are bitter in taste and soapy to touch. Acid turns blue litmus red. Bases turn red litmus blue.